When we think of Christmas and holiday movies, we never think of something scary. In fact, November 1st is usually when the scary stuff stops and heartwarming, wholesome holiday stuff starts overflowing every store and every commercial lot across this great nation. Why be scared when we already were scared for an entire month? The time between November and January is for love, care, tenderness, friendship and everything that makes us all feel warm and fuzzy inside. This year, that is going to be altered a bit. 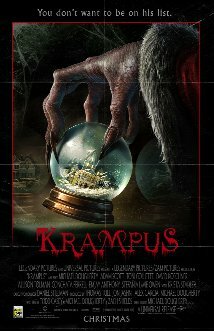 A movie about the legend of Krampus, a anti-Santa Claus spirit if you will, shall hit theaters this holiday season. Judging from the trailer it looks like a total blast! Watching the trailer, I am getting a big "Gremlins" vibe, and I absolutely love it! Although the first "Gremlins" was a summer movie in 1984, it could have easily been a Christmas movie since it takes place on that holiday. It looks like "Krampus" will be a blend of horror and comedy. While I usually warn against that type of mash-up, this looks too good to pass up. It has a cast that includes Adam Scott, Toni Collette and David Koechner, a cast you can't really go wrong with. But I am digging the style of this movie. This sincerely looks like I will be laughing in between scares, and I can't wait to set my eyes on it!